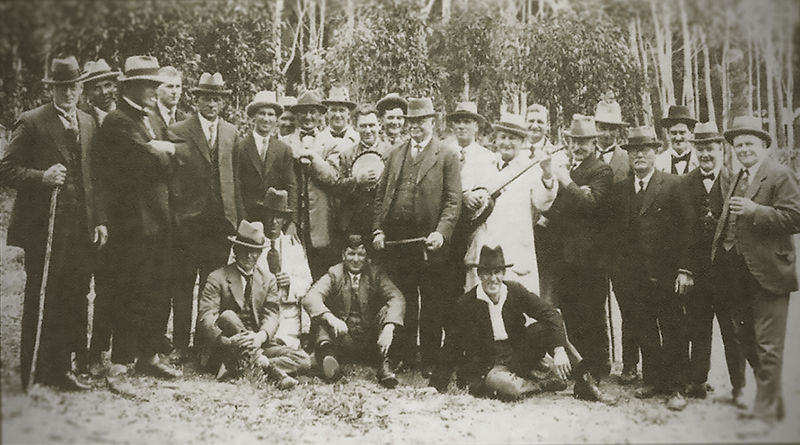 A group of men, all German settlers, who have been around Lobethal since 1842. They came here as eager young men. They work hard at their jobs and feel they’ve earned a beer, or three, from the Rising Sun hotel before they go home for their tea. After a little “lubrication” someone starts to sing a well known song, possibly even a hymn from church. Someone else joins in, then someone else, before long, a whole group are singing, with a couple even adding a harmony line. “Ja, ja, ja,… das ist ein guter Gedanke! !” There was a general agreement and so Lobethal Harmonia Verein is born (Lobethal Harmony Club as it later became) and that same innate sharing of the love of music continues to this very day! So, in 1878 the choir was formed through the efforts of Mr. O.F. Schubert, a Lobethal schoolmaster, who became its first conductor. The name of the club was taken from that of a singing club in the part of Germany from which many of the district’s pioneers migrated. After twelve months of work, the Harmonia Verein found itself in such a strong position that it was able to engage a professional musician, Herr. C. Püttmann , as its conductor, and its fame spread in the musical world of South Australia. Later, however, difficult times appeared. The Lobethal Tweed Factory, afterwards taken over by the Onkaparinga Woollen Company, was temporarily closed, and many of the members of the club left the district. Gradually the club dwindled until it consisted of a double quartet, and finally only four members Messrs. Kumnick, Kleinschmidt, Lauterbach and Schubert were left as a quartet. 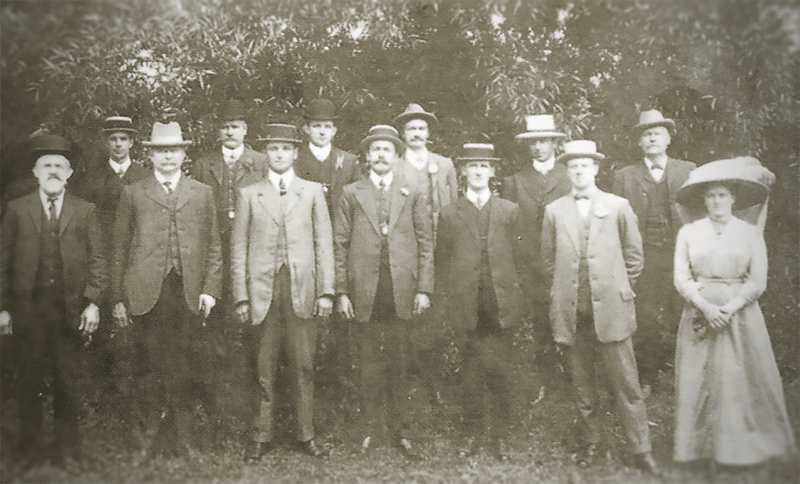 In 1911, however, the club was formed again, with 12 singers (below) and a membership of more than 60 associates. Front Row: O. Kumnick, F. Lauterbach, F. Kleinschmidt, N. Kummick, J. Meins, H. Lauterbach, Mrs. M. Pfeiffer. Back Row: S. Burnley, O. Kleinschmidt, S. Jantke, F. Koehne, R. Peiffer and R. Schubert. Mr. F. Lauterbach was conductor, and for 16 years the club enjoyed success until Mr. Lauterbach’s failing health compelled him to retire. The numbers didn’t stay that low as the next picture from the same time period shows. We are currently compiling a History Book of the club. Watch this space for more information to come …..
Another link with the past : Clara Serena (1890-1972) a world renown Contralto Opera Singer was born on 9th June 1890 at Lobethal, South Australia. Clara’s husband Roy Mellish a noted Conductor and accompanist to Clara, was a mentor to the Lobethal Harmony Club, and spent time conducting the choir after their return from Europe, late in their careers. The Lobethal Harmony Club supports local charities and groups by committing ourselves to Perform Concerts at their venues to assist these groups in fund raising. During both World Wars and throughout our history the club has contributed to assisting fund raising activities of Red Cross and other charities that supported humanitarian efforts during the war. Send us a message or call us, details under Contact if you wish to arrange a Concert to support your group.